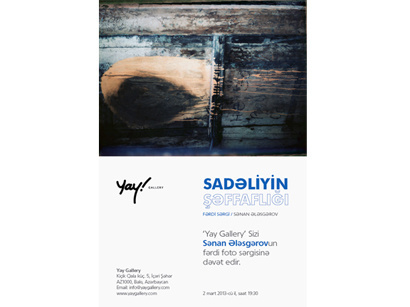 An exhibition of well-known Azerbaijani photographer Sanan Aleskerov, organized by YARAT! Contemporary Art Space, an organization promoting Azerbaijani contemporary art locally and worldwide, will be opened at the Yay Gallery in Baku on Saturday, March 2. The Transparency of Simplicity exhibition, which will last until April 2, is an experimental project by Aleskerov. An artist-produced new photo series includes 25 colored photos synthetized through combination of technical performance and a universally accepted simple stuff beauty issue. Fragmentariness is nothing more than a predominant environmental perception viewpoint of the artist. What grassroots generally fail to notice is a must-see for Aleskerov, be it a suddenly cast sunshine or a shadow on a road, glamorous branches of an old creaking tree, a children's playground requiring maintenance or any other images -- all these are capable to inspire new thoughts, connotations, feelings and fancies, and the artist makes use of that, while begetting concrete and abstract images of subjective beauty in his photos. The photo series evidently reveals the ardent desire of generating images endowed with virtues of beauty and simplicity of the commonplace. As for nature, it generally renders support and plays the role of image-making texture fabric. Sanan Aleskerov was born on January 10, 1956 in Baku and graduated from the journalism department of the State University in 1982. When he was a child Aleskerov wished to become a train conductor, a guitarist, an archeologist, and even a pilot. However, opening the pages of the Photo Review magazine where he saw the works of well-known photographers changed all his childhood dreams and showed another world of light, texture, and movement, the geometry of lines, contrast, shadow, tones, rhythm, symmetry and asymmetry. "I began to see, I began to scan the world. I was interested in the most mundane things, not big events, but small happenings - unidentified and inexplicable," Aleskerov writes on his website. Aleskerov's photography subject is life itself, the author's understanding of life. In his photography, Aleskerov tries to stay truthful and even documental, as he believes that facts are important in photography, however, images must say more. According to Aleskerov, photographs change the essence of things. "There must be some mystery, some sort of joy from uncovering a secret, an answer to a question, a piece of knowledge or even wisdom. Another important thing for me is to understand stones, trees, houses, the road, eyes, the hands of a person. You must hear them... You must see with your heart..." he stresses. As for the aim of his photographing, Aleskerov notes that he wants to portray the nuances, the thin threads that connect him to the outside world, as in photography he shares his life and the understanding of life with the viewers.